Order any three Astrolearn CDs for just US $45 plus shipping to all countries shown below (SRP: $60 + shipping). US orders: please send US $50.75 ($45 + $5.75 economy mail). Please pay by Paypal to solger@comhem.se, specifying the series numbers of the three CDs you want (see details via links below) and your shipping address. NB: Please allow 1-3 business weeks for delivery in the US; 3-5 business weeks for delivery by economy airmail. New for 2016! High-quality full-colour facsimiles of classic astrology books, in affordable cherry-picked selections on CD, in Adobe PDF format. 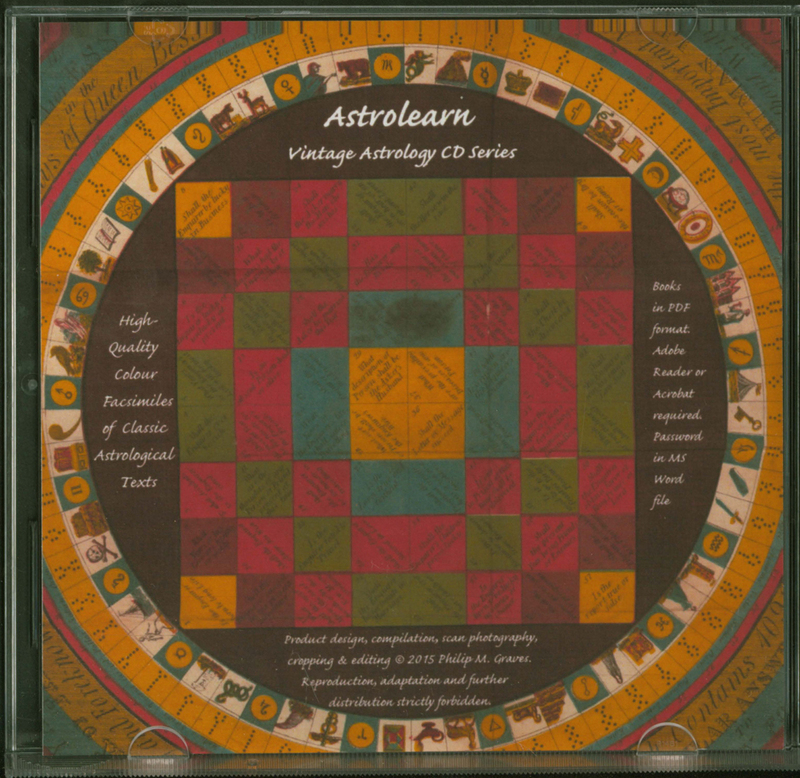 The astrological text scans on each CD are of identical quality to those in the DVD series described on their separate page, and have the same hidden OCR layers for search purposes. The above image shows the design of the inside of the front cover on all CDs in the series, actual product, photographed in its jewel case. The links below show all other relevant pictures and details for the individual titles listed. CD orders are handled by a remote manufacturing-on-demand and distribution service in the United States. They are therefore subject to US dollar currency payments and different shipping rates that cannot be calculated automatically through our DVD shop. So we ask you kindly to add up your own total according to the following table, and send remittance with a note clearly detailing the CD numbers you wish to order to our business Paypal account on solger [at] comhem.se. We will then submit your order to the manufacturer. The price of each CD is just US $19.99 plus shipping at cost (including unavoidable Paypal commission on shipping fees). Orders of six or more CDs cannot be cost-effectively processed by our manufacturer as single orders. They will therefore be treated as multiple orders and costed accordingly by the most efficient mathematical logic available (e.g. 6 CDs = 3 + 3; 7 = 4 + 3; 8 = 4 + 4; 9 = 5 + 4; 10 = 5 + 5). If you are unsure of the total due and would like an invoice in advance, please email details of your order to the same email address shown above, that is solger [at] comhem.se, and we’ll get back to you. Thank you very much for your interest in our products, and for your custom! NB: For purchases to any country not in the above lists, please contact us using the Contact Form or directly to solger [at] comhem.se. Direct shipping from the United States is not available to other countries, and additional costs and significantly longer times will therefore apply. All the above printed rates are applicable to CD sales to the listed countries supported by direct shipping from our manufacturer in the United States only. Please allow up to six business weeks for the delivery of all CD orders. The majority will be delivered within two to four business weeks, but some may take longer, depending on your location and other variable postal factors. Owing to the rigours of international shipping and the streamlined, efficient packaging service used by our manufacturer, we cannot guarantee the integrity of the plastic jewel cases in which our CDs are packaged. Your payment is for the CD, files and artwork; and you accept that a cracked jewel case does not constitute a reason to reject the shipment or seek compensation. You must be willing to replace any cracked jewel case at your own minimal expense with an alternative case or sleeve of your choosing. It should be easy enough to take out the printed inlay card and tray card and fit them in any standard CD jewel case bought in your country and locality. We guarantee the physical integrity of our CDs and accessibility of our files directly from them for a period of five years from the date of purchase subject to proper care and storage (store in their packaging out of direct sunlight and between 5 and 30 degrees Celsius (41 to 86 degrees Fahrenheit) at all times. Do not bend, scratch, write on, or soil the CD, or subject it to any kind of liquid; and keep out of the reach of small children, pets and pests). You are strongly recommended to take back-ups of the files onto your main computer or other personal storage device at regular intervals for the duration of your ownership of the CD. You should thereby be able to prolong the life of the files indefinitely. If the CD eventually stops working as a result of natural degradation with age, you will then still have the files and can continue to enjoy the original artwork for display purposes. Copyright notice: Please note that you may not lend the CD or distribute copies of the files on the CD to anyone else for any reason, upload them to the Internet, or save them on any public or shared institutional or corporate computer, network, or any other shared device. If you sell or give away the original CD, you also forfeit the right to keep copies of the files for your personal use and must erase them completely and permanently wherever you have stored them. Your licence to access the files and to store copies of them on other devices for your personal use or as back-ups consists in and is limited by your exclusive ownership of the original physical CD.